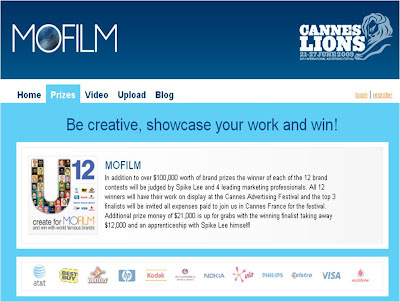 MoFilm have launched a creative competition called “You to the Power of 12-U12” - details available at http://cannes.mofilm.com. The competition is based around the Cannes film festival and offers some great prizes, plus the chance to meet Spike Lee. Some of the world's leading brands have added creative briefs to the MoFilm website (AT&T, Best Buy, Doritos, HP, Kodak, Renaissance Hotels, Nokia, OMO, Philips, Telstra, Visa and Vodafone.) 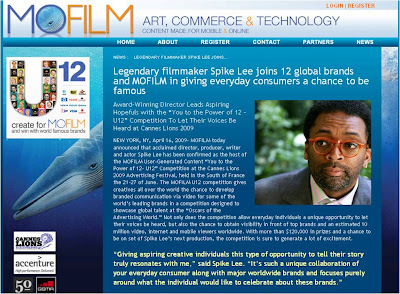 The MoFilm competition allows internet users to create their own video interpretations of these briefs and then submit them for judging by a panel that includes Spike Lee. There will be a winner for each brand, so 12 winners in all. All the winning entries will be showcased at the Cannes Advertising Festival and the top 3 invited to Cannes on an all expenses paid trip. The winners will also get a share of a prize fund, a prize offered by the brand that they worked on and the chance to work with Spike Lee. Deadline for entries is June 8th - good luck!